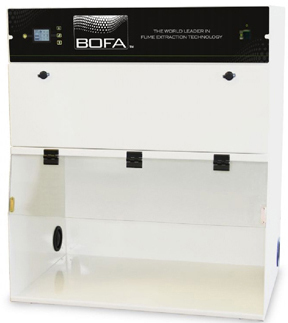 BOFA (UK) Ltd was established in April 1987 and has unrivalled expertise in the field of fume extraction and filtration. 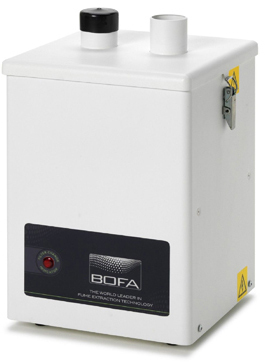 BOFA - Design, Develop and Manufacture fume extraction systems for a wide range of industrial sectors and applications. Products manufactured ensure operator safety by capturing harmful fumes which are generated during production processes. Hazardous particles and gases (fume) are captured and filtered out before the cleaned air is re-circulated back into the production environment. 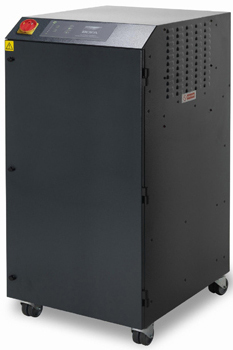 V200 solder fume extraction unit has been designed primarily to extract the fumes generated during hand soldering in the electronics industry. 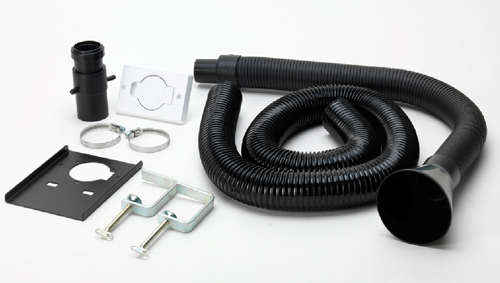 This portable system comes with an extraction arm and installation kit. Minimal installation and mobility at ease. 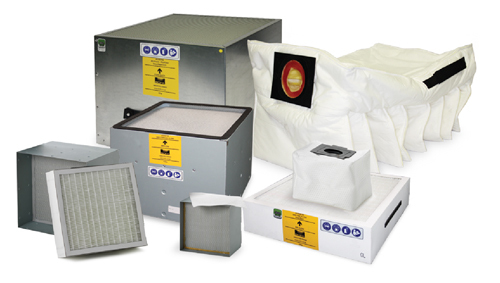 Good filtration with Pre and HEPA filters. V250 solder fume extraction system has been designed primarily to extract the fumes generated during hand soldering in the electronics industry. This portable system comes with an extraction arm and installation kit to set up 2 operators with ease. V 600 high volume extraction system offers protection against harmful fumes. 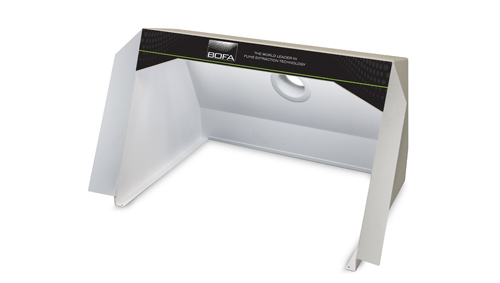 This unit incorporates 3 stage filtration, filters condition display, and built in silencing. A truly state of the art fume purification solution. 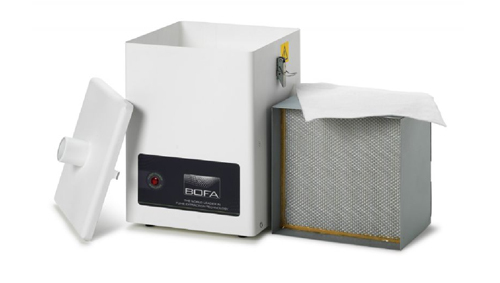 BOFA’s high end range of extraction systems combine large filter capacity with high airflows and pressure. V1000 iQ high end extraction system combines extremely large filter capacity with high airflow and pressure rates. Ideal choice for heavy duty applications for large amounts of particulate and gaseous organic compounds. 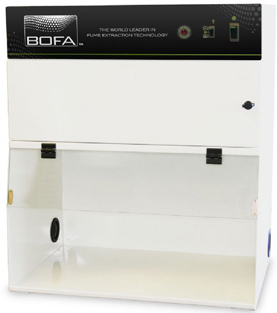 BOFA’s new iQ Operating System, making the new V1000 iQ one of the most advanced system. Turbines with high airflow and pressure. Independent filter condition monitoring, display and warnings. Filters with long life and low replacement cost. Reverse Flow Air filter technology. The FumeCAB 700 integrated filtration system has been designed to ensure compliance with the latest regulations. The innovative Cam filter change design enables safe and simple front loading filter replacement and provides many benefits over alternative rear access systems. with optional UV lighting, making the FumeCAB 700 an ideal choice for applications such as the conformal coating of PCB's where operators can now easily identify uniformity issues with the coating. 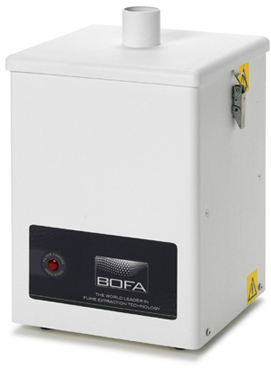 Certified to BS 7989:2001 Re-circulatory filtration fume cabinet specification. Ensures operational compliance with HSG258 guidelines. Energy saving ultra-bright slim line LED lighting. Twin coated anti UV/anti splash protective Polycarbonate visor. Side entry blind grommets for equipment access. Audible and visual warning alarms. FumeCAB 1000 iQ integrated filtration system has been designed to ensure compliance with the latest regulations. Ultra-bright slim line energy saving LED lights come as standard. with optional UV lighting, making the FumeCAB 1000 iQ an ideal choice for applications such as the conformal coating of PCBs, where operators can now easily identify uniformity issues with the coating. 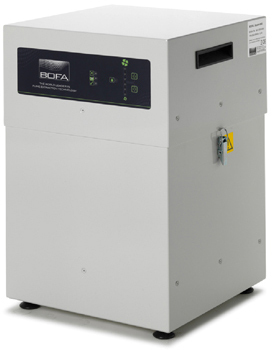 Combined HEPA/Gas filter incorporating ACF technology. Certified to BS 7989:2001, Re-circulatory filtration fume cabinet specification. Twin coated anti UV / anti splash protective Polycarbonate visor.